Have you ever imagined what the architecture of Africa would look like today, if the great civilizations of Egypt, Timbuktu, Mali, the Dogon, Zulu, Yoruba, and thousands of other African empires had continued to develop and evolve in their own unique identity. Imagine the transformation of the African landscape into sprawling metropolises filled with architectural masterpieces celebrating new interpretations of traditional design elements, portrayed with all the comfort of modern innovations and technique. Amazing structures of African aesthetics, in abstract and organic and organic form, from technologically advanced materials that paid homage to architectural elements steeply rooted in the plethora of rich African cultures. Now imagine once again that you have been given the opportunity to create that new architectural language for Africa…drawing inspiration from her glorious past, reflecting elements of contemporary identity, to then deliver a design so dynamic and innovative it creates the foundation for her emerging future! You, the creator and custodian of Africa’s newly built environment, to develop the most advanced design language of the millennium – the architectural language of Africa’s’ future. Giving Africa A Face in Modern Architecture. What Africa would you build?… If given the opportunity to redevelop Africa’s built environment in her own identity. 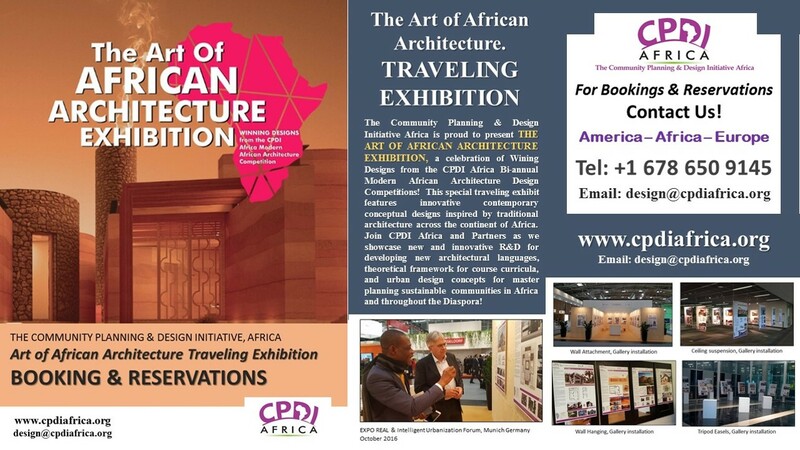 As a participant in the CPDI Africa design-build competition, the role of the architect, engineer, artist or planner, is to First conduct research into the cultural history of African architecture. Understand the impact of lifestyle and how social philosophy and activities were (and still are practised) in space utilization and location within the home, family compound and community. Explore the aesthetics or architecture and the artistic languages of the various ethnicities. Understand the reasons why particular materials and building techniques were preferred and utilized across the Continent. Identify those traditional elements of design that still have value, and are relevant in todays architecture. Next, harmonize these traditional design elements with features from contemporary architectural practices, paying special attention to sustainability, availability and affordability of local materials. Through this design process, collaborating architects, artists and engineers will create stimulating Successful Design Prototypes, used to build culturally sound and sustainable neighbourhoods and cities! Giving Africa a face in modern architecture, by fast-tracking the evolution of African architecture and stimulating the consciousness of research and learning institutions towards achieving this goal. Sensitize the African community and urban development professionals on the need for the development of a new architecture for Africa that is culturally and environmentally sustainable. Promote research within learning institutions for developing African architectural methods, that are relevant and applicable to the general population. Encourage the full development and utilization of locally sourced organic building materials, by professionals as an alternative (for construction.) in solving building cost effectiveness and structural viability. Influence the development of design and building codes that reflect and protect true and sustainable habitation patterns in contemporary African communities. To take action as the future developers of Africa’s built environment, by building healthy sustainable neighborhoods which exemplify and promote the best practices of urban Africa. To breathe new life into the original African traditional concept of community development, founded upon neighborhood participation through community sweat equity. To foster collaborative ventures between development professionals in Africa and the Diaspora, for the development of our communities on and off the African continent.